This image is from a solitary 7.0 cm renal mass in a 65 y/o male. He presented with gross hematuria and was found to have a mass in the lower pole of his right kidney on imaging studies. Radical nephrectomy was done. The tumor cells are arranged around blood vessels creating pseudorosettes. 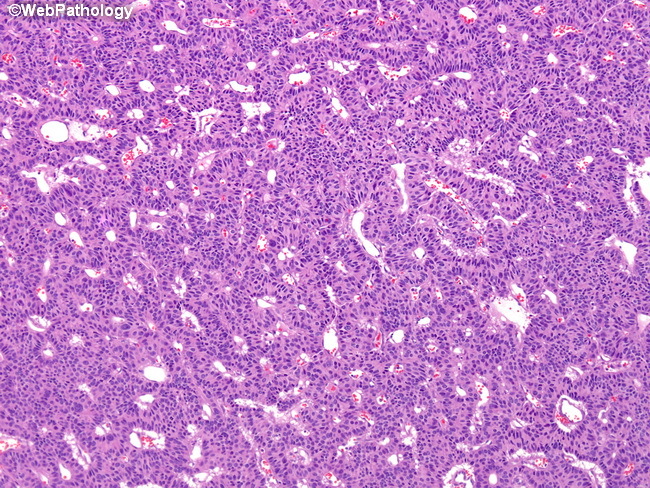 Elsewhere in the tumor, they were arranged in solid nests, glandular patterns, and cords with ribbon-like appearance. They were positive for chromogranin, synaptophysin, and CAM5.2.